Zest lost twice, nobody won ace matches besides Creator (who even has him? 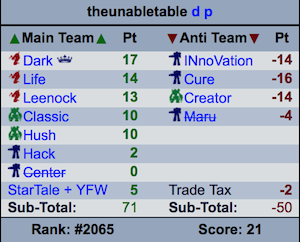 ), who turned out to be legitimately good at PvP, and MarineKing, who lost to Journey, and nobody that won was way ahead of everyone else in terms of being on main teams. I cop out of a lot of these awards anyway. It'll be a thing soon. These players made a lot of people happy, but none of them were betted on much more than the other two, with all three being on between 366 and 401 main teams, so this has to be split three ways. Additionally, all of them got a fifth point. MarineKing got a TvP in the ace match after initially losing, Rogue cruised to a three game win streak, and Dream comfortably secured a win against the red-hot Leenock to earn an extra point for breaking a win streak. 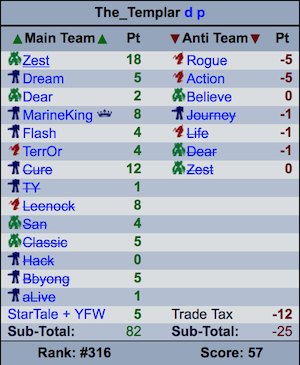 Creator (87/332)* defeated Zest (265/57)*, which surprised quite a lot of people that had neglected to trade him from their anti-team after he stopped facing Zerg players. Then he followed up insult with injury as he improbably defeated Zest a second time in the ace match by playing a perfectly reasonable macro game; For reaching a three win streak, breaking Zest's three win streak, winning twice, and having his team win, Creator earned an impressive ten points this week, which made a lot of people irritated, a few devout fans (Lorning) ecstatic, and everyone else slightly amused. *(100/10) would mean 100 people picked this player on their main team and 10 picked him on their anti team. 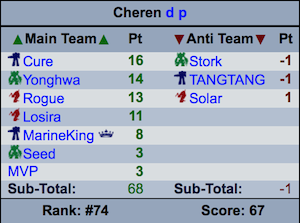 Haha, Solar lost again. Even Flash recorded a win this week. It annoys me when a no-trade team wins "best team of the week" on week 5, so I'm just going to let you look at this guy's pretty farsighted picks. On the other hand, it delights me when a no-trade team wins this award, often because they could have completely avoided it. 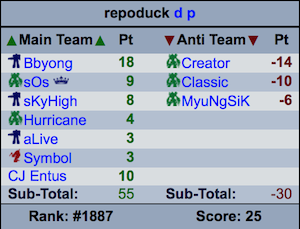 While MyuNgSiK is by comparison a fine anti-team pick, Creator should probably have been traded off eventually and Classic was a poor choice to begin with, and that's just the negative points. This guy also picked sKyHigh, Hurricane, aLive, and Symbol on his team to join his two ace players. These four players are... not the best idea to have all of because it's unlikely more than one or two of them will ever see regular play time. This is why trading is good, guys. Needless to say, nobody found this combination, which I believe to be the only possible way to have a flawless anti-team. This will probably be impossible after the coming week. There's also four of the same people as the last two weeks that managed -1. To be honest, I'm cycling through really bad anti-teams at this point to avoid talking about the same people over and over. This guy traded Maru --> INnoVation after week one, which sort of blew up in his face when INnoVation went on a huge win streak and Maru didn't. Cure and Creator are also very solid players on their teams, so picking both was, in hindsight, a poor idea. Honestly though, I don't think a lot of people really get how to pick anti-teams, even though this round was easy since TaeJa/Stork/Seed became a thing. Yes, I'm covering my team in this blog too, because obviously I'm egotistical . Also, it's funny to look at a team with a ridiculous number of trades like this one. My biggest mistakes initially were picking MarineKing as my captain and aLive to be my "extra" player. aLive was a two-point player that was unlikely to see play time and was slightly less unlikely to get a ton of points from his team. I was going to pick Dark and YongHwa (which would have made Bbyong my captain), but for some reason I changed my mind at the last second, a decision which has cost me at least 20 points. My original team was aLive, Bbyong, Classic, Leenock, MarineKing, and Cure with Startale-Yoe, and my anti-team was Zest, Action, and Journey. Hack had appeared in the week 2 lineup, and I was hoping to get something done with two points that I quickly realized were pretty dead. Also, since Zest was playing someone besides Maru, I hastened to get him off my anti-team, putting a suspiciously absent Dear on instead, and traded him onto my main team instead. This initially did not work out as Zest only earned two points in week two, but he soon won two ace matches and made me feel warm and fuzzy inside. In retrospect, I shouldn't have spent so much time on my two point investment, especially as I was unlikely to get traction out of it. However, I was pretty sure TerrOr would win, so I went for it, and sure enough I was right. Classic –> San was a profitable investment at first, but Classic won later matches and San didn't so it pretty much evened out. Dear –> Life on my anti-team was easily the most risky, but I figured Dear was returning to form and Life wasn't. I was sort of right, but Life won lots of games over the next two weeks to leave me shaking my head. I seriously regret these main team trades. By making these trades, I was trading two Startale players for two KT players, even though Startale was my main team and both Leenock and San were playing. The TY trade was obvious and it paid off. Cure –> Dear was based upon the expectations that Cure wouldn't win another time and that Dear would redeem himself (neither happened). Anyway, Dear had an easy opponent in Center... and then MarineKing beat him in the ace match. My players can never play nice, can they? My main team players are facing the following people. This is... moderately grim, to say the least. First of all, I must keep Zest because he is facing the weakest opponent, and MarineKing as he is my captain. I will also keep Dear since Dark's specialty is ZvT, and Dear did manage to beat Life a few weeks ago. This means that I'll be trading Flash and Dream from my main team. I have a very good chance of earning points here. SKT will almost certainly not win 3-0, as they are fielding Sorry (sorry, Sorry), and Classic just beat Life, so he should be able to beat Shine, especially since Classic is an exceptionally good cannon rusher and Zest beat Shine after taking a lead through a cannon rush recently. As a bonus, SKT could possibly maybe even field Classic in the ace match, although, if INnoVation wins, it's probably stupid to not send him in that situation. This leaves me with a difficult choice. Who do I trade Flash with? My best options are likely Curious, who faces Losira, YoDa, who is playing a TvT against Cure, or BrAvO, who is likely to beat up on Sorry. I actually can't believe that I'm considering Flash –> BrAvO as a legitimate FPL trade. It will be hilarious if Sorry wins anyway, the exact reason I traded for TY when he played against Guilty. Turning to my anti-team, I have Action, Believe, and Rogue. Clearly I must trade Rogue for one of the following players. YongHwa: Not playing; however, Choya. Cure: TvT against YoDa, could go either way. ByuL: Plays against TY, who lost to Guilty. It's definitely safest to trade for Choya YongHwa, so I will do so. Hopefully this doesn't horribly backfire. Zest --> Dear --> Life --> Rogue --> YongHwa is a pretty good progression in terms of anti-teams. Soon, I will have three B-teamers on my anti. fun read as always. 1 quick question you have any Idea how many total teams there are? also I'm about ready to write a eulogy for my fpl team. I'd be in a fairly good position except that I forgot that Creator was on my anti-team... Ah well. Nice recap. Seeing your team really gives me the feeling I should trade more. Hmmm, I considered the Flash --> BravO trade, but it seems unlikely that it will pay off in the long run. I expect both KT and Samsung to lose their matches with KT having considerably better odds at pulling an upset. BravO has better odds at winning his game, but he has no ace potential nor does he get played every match. Plus Samsung will be playing their last match versus Jin Air next week and KT versus StY, the odds lie in favor of Flash there. Curious to see how this pans out. This would be true if we were about to start week 3 or 4 instead of week 6. Since there are only two weeks left, I would rather get a player that is almost guaranteed to win this week, and if he doesn't get fielded next week, there is likely another trade I can make (Not entirely sure how trade values work, but BrAvO's might be higher than Flash's next week). The goal is to focus on getting points now instead of having a strong, reliable team.